I love Christmas themed food and I especially love Christmas themed cupcakes. 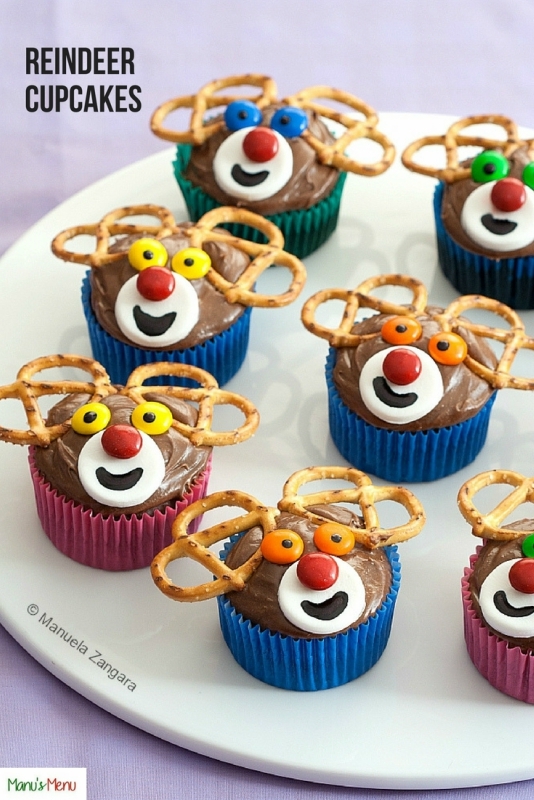 After sharing my Christmas Tree Cupcakes a few days ago, today I am back with these Reindeer Cupcakes. Aren’t they the cutest thing ever? My girls absolutely adored them and the best part is, you can involve the kids while decorating them as they are really easy to make. It is a fantastic project to bring the family together this Christmas holidays! And if you are a chocolate lover, like us, you will appreciate the fact that these are double chocolate cupcakes… yes, chocolate cupcakes + chocolate buttercream! If you have buttercream leftover, you can make my Leftover Buttercream Cookies. Enjoy! 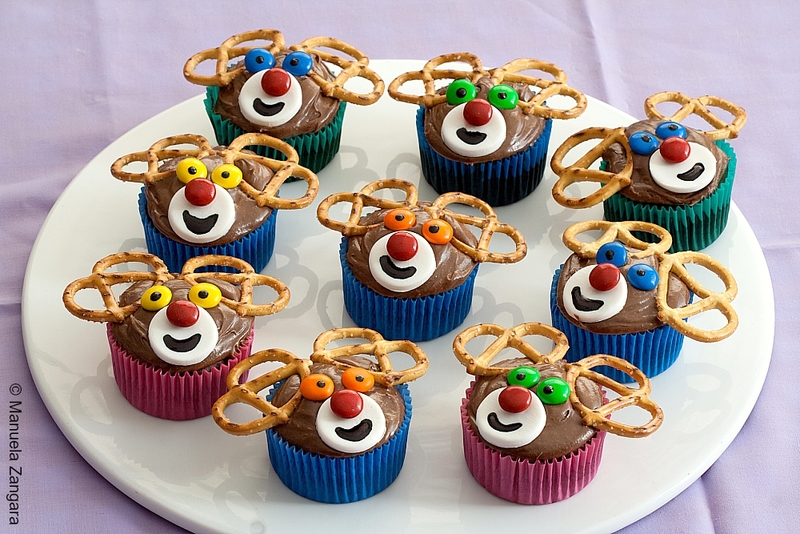 Reindeer Cupcakes – double chocolate cupcakes that are so cute and perfect to make with the kids this Christmas! Preheat the oven to 165°C – 330°F and line muffin trays with papers. Combine the flour, cocoa, baking powder and salt together in a bowl and set aside. Then cream the butter, vanilla and brown sugar until pale and fluffy. Add the eggs, one at a time, beating until well incorporated. Remember to scrape down the sides of the bowl as needed. Add the flour and cocoa powder mixture in three batches, alternating it with two additions of buttermilk (or yogurt) and milk. Beat until well combined. Put the batter into the lined muffin tray cups, filling each to about half. Beat the softened butter with an electric mixer fitted with a paddle attachment for a few minutes and then slowly incorporate the icing sugar, cocoa powder, milk and vanilla extract. Mix well. Use a small spatula to apply some chocolate buttercream on the top of each cupcake. 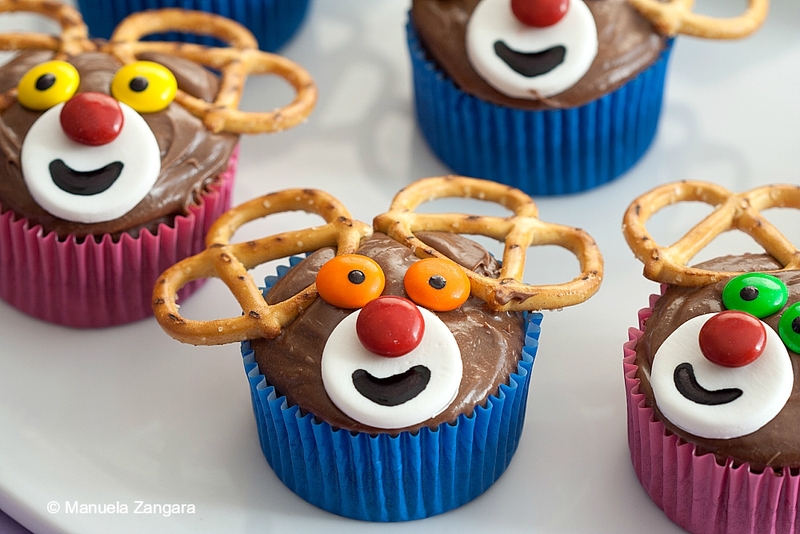 Use the white fondant to make the reindeer’s face, M&M’s to make the nose and eyes, the pretzels to make the ears, and the black food colour gel to draw the pupils and mouth.